In 2016, BOVET 1822 unveiled the Shooting Star tourbillon, the first timepiece in an exclusive collection dedicated to astronomy. The AstÃ©rium and Grand RÃ©cital tourbillons then followed in 2017 and 2018 respectively. Each of the three timepieces boasted groundbreaking technical specificities and explored new ways of measuring time, and each was also housed in a characteristic inclined case, inspired by and shaped like a sloped writing desk. Designed by BOVET 1822 Owner, Mr. Raffy, the â€œwriting slopeâ€� case features a bezel inclined at 6 oâ€™clock. This ingenious idea makes it possible to diversify and organize the types of displays by using domes, rollers, discs, and three-dimensional hands to enhance intuitiveness, ergonomics, and elegance. The three-dimensional design prioritizes information for improved readability and brings the collectorâ€™s eye to the heart of the movement to discover the excellence found in each detail. As seen by the numerous awards bestowed on the trilogyâ€™s timepieces, including the Aiguille dâ€™Or Grand Prix to the Grand RÃ©cital by the Grand Prix dâ€™Horlogerie de GenÃ¨ve, collectors and experts commend the stylistic revolution led by the â€œwriting slopeâ€� case. Mr. Raffyâ€™s inspired â€œwriting slopeâ€� case design meets and once again exceeds collectorsâ€™ expectations in the Maisonâ€™s latest timepiece, the RÃ©cital 23, by simultaneously introducing four complications developed specifically to be housed within the â€œwriting slopeâ€� case. 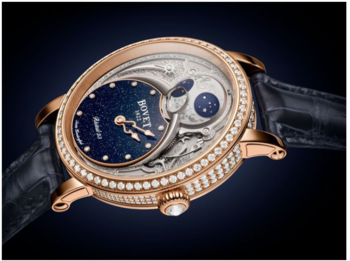 The RÃ©cital 23 is the first BOVET womenâ€™s timepiece to feature the â€œwriting slopeâ€� case, which is designed here for the first time in an oval shape that is 43 mm high and 28.7 mm wide. Hours and minutes occupy an off-center dial at 6 o'clock, while a deeply poetic three-dimensional moon phase is displayed on the upper section of the timepiece. Since the dawn of time, people have been telling the time by the stars. Many cultures still use the lunar calendar and the dates of many â€” often religious â€” celebrations are frequently established according to the age of the moon. The moon also exerts a physical influence on our world, notably on the tides. Fishermen as well as farmers and winegrowers order their activities in accordance with our natural satellite. Sensibilities and moods are also often connected to lunar changes and it seems illusory to attempt to draw up an exhaustive list of the beliefs and influences attributed to the moon. The RÃ©cital 23 timepiece is driven by a self-winding mechanical movement. Its oscillating weight in 22-ct gold is finely hand-engraved with the "Fleurisanne" motif that Maison BOVET 1822 has been producing for almost two centuries. Its oscillations power two barrels whose energy guarantees 62 hours'- of power reserve. The module, entirely developed and manufactured in BOVET 1822's workshops, makes it possible to offset the time display and add the moon phase indicator. Presented in the form of a hemispherical dome, the moon phase indicator majestically corresponds to the volume of the "writing slopeâ€� case. The dome's surface is engraved to evoke the lunar surface and filled with luminescent material. This feat is all the more remarkable due to the indicator's camber. It is read via a three-dimensional circular aperture that singlehandedly requires over a day's work to be manufactured and decorated. The precision mechanism used to drive the moon phase requires correction only once every 122 years. Keen to develop useful complications that would allow everyday use of the timepiece, Mr. Raffy â€” BOVET 1822's Owner â€”soughtto incorporate a push button into the cabochon of the crown so as to be able to adjust the moon phase. The latter is therefore easily modified without needing to use the slightest tool. For its debut, the RÃ©cital 23 will be available in white gold, red gold or titanium models. The gold cases may be decorated with a bezel set with round diamonds or baguette-cut diamonds or be entirely paved with round diamonds. The dial dial-makers of BOVET 1822 have created two dials of choice for this new piece. As she wishes, irrespective of the case's material, each collector will be able to choose between a dial of blue aventurine glass or black Tahitian mother-of-pearl adorned with a delicate guillochÃ© motif. Elegant hour and minute hands gracefully glide over each dial. Every hour, when the hour and minute hands overlap, their atypical designs forms the shape of a heart, outlined in negative space. Timeless and symbolic, the new RÃ©cital 23 represents the values which drive Mr. Raffy and the artisans of BOVET 1822 : passion for fine watchmaking, and a devotion to perpetuate BOVET 1822â€™s illustrious history with noble new expressions of the timekeeping art. BOVET is a Swiss Manufacturer of luxury timepieces. Since its foundation in 1822, BOVET has artfully combined the most sophisticated mechanisms with the finest craftsmanship, employing artisanal techniques such as gem-setting, engraving, and miniature painting. Under the visionary guidance of Owner Pascal Raffy, BOVET acquired renowned tourbillons and dials manufactures in 2006 and DIMIER 1738 immediately began producing the Maisonâ€™s movements, hair springs, and dials in-house. His passion for Haute Horlogerie also led to the introduction of the remarkable AmadÃ©o convertible case system, which draws inspiration from the exquisite 19th century pocket watches produced by BOVET. Today, the House demonstrates its excellence through varied collections that encompass models as emblematic and remarkable as the Edouard Bovet, Braveheart, OttantaSei, Grand RÃ©cital, AstÃ©rium, and Shooting Star tourbillons, to name just a few of its icons. Today, BOVET has been rewarded with more than 25 awards and distinctions, honoring the virtuosity of the Maisonâ€™ artisans and their intangible passion to define luxury in its most noble expression. For more information, please visit www.bovet.com.